pdeellip(xc,yc,a,b,phi) draws an ellipse with the center at (xc,yc), the semiaxes a and b, and the rotation phi (in radians). The pdeellip command opens the PDE Modeler app with the specified ellipse drawn in it. If the app is already open, pdeellip adds the specified ellipse to the app window without deleting any existing shapes. pdeellip updates the state of the geometry description matrix inside the PDE Modeler app to include the ellipse. You can export the geometry description matrix from the PDE Modeler app to the MATLAB® Workspace by selecting DrawExport Geometry Description, Set Formula, Labels.... For details on the format of the geometry description matrix, see decsg. pdeellip(xc,yc,a,b,phi,label) assigns a name to the ellipse. Otherwise, pdeellip uses a default name, such as E1, E2, and so on. 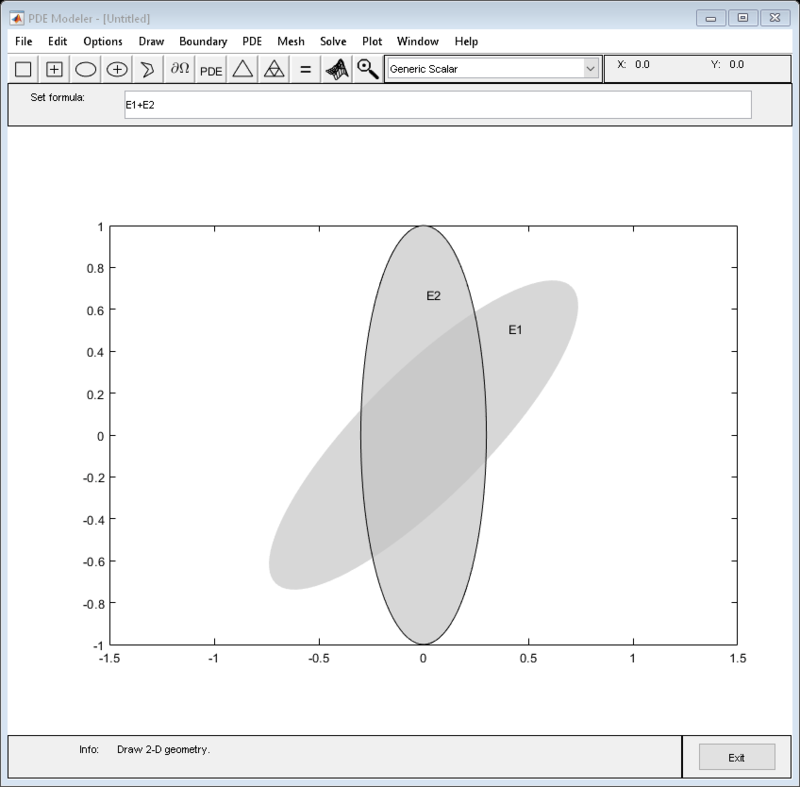 Open the PDE Modeler app window containing an ellipse with the center at (0,0) and the semiaxes 1 and 0.3. Rotate the ellipse by π/4 counterclockwise. Call the pdeellip command again to draw an ellipse with the same center and semiaxes, but rotate it by π/2 counterclockwise. The pdeellip command adds the second ellipse to the app window without deleting the first. 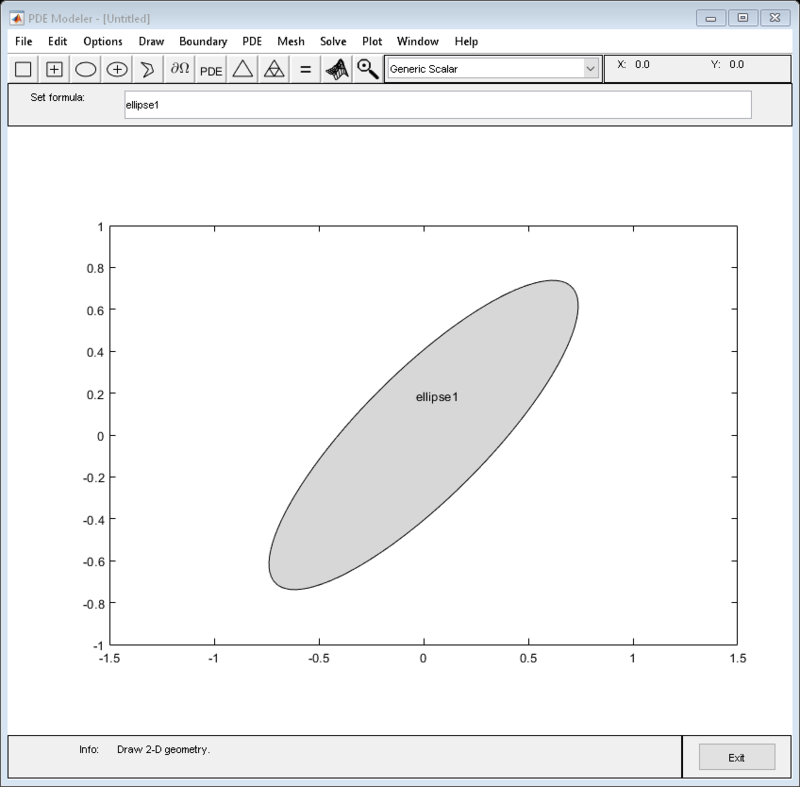 Open the PDE Modeler app window containing an ellipse with the center at (0,0) and the semiaxes 1 and 0.3. Rotate the ellipse by π/4 counterclockwise. Assign the name ellipse1 to this ellipse. x-coordinate of the center of the ellipse, specified as a real number. y-coordinate of the center of the ellipse, specified as a real number. Semiaxis of the ellipse, specified as a positive number. Rotation of the ellipse, specified as a real number. The rotation value is measured in radians. Name of the ellipse, specified as a character vector or string scalar.